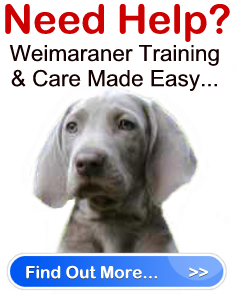 Weimaraner Training Tips " "
Weimaraner training is a must for your dog. This breed is incredibly high strung and intelligent. Without the proper guidance and attention, they can become quite destructive, suspicious and insecure. Hence, proper obedience training is a must for this breed. An experienced trainer can help you gain the control and confidence you need, to give your dog the direction and understanding he requires to develop into a credit to his breed. Of course, not all Weimaraner training should deal with behavioral commands. Sometimes, the lessons you teach your dog can be for the sake of playing and having a good time. One such technique is teaching your Weimaraner how to play fetch. The following information will provide you with the steps you need to make Weimaraner training for fetch a successful and enjoyable experience for both you and your dog. Fetch is one of the easiest lessons you can teach your dog. Why? Because it is in a dog’s nature to carry things in his mouth. Therefore, the best items you can use for Weimaraner training in regards to fetch are his favorite toys. Note: Make sure your Weimaraner first knows the “Sit” and “Stay” commands before teaching him fetch. Step 1 – Begin training by having your dog sit. Put his toy three steps away from him so he can clearly see where it is. Tell your dog to find his toy by saying, “Find Toy” or “Find” along with the actual name of the toy. As soon as he goes to the toy praise him immediately. Even if he doesn’t make contact with the toy, praise him for his action and give him a treat. Continue to repeat this Weimaraner training step until he picks up the toy. Take it slow, give him encouragement and praise him each time he goes to the toy. Once he is successful, take a break. Have a nice play time and relax before going back to the lesson. Step2 – Once your Weimaraner has managed to retrieve his toy, your next task is to get him to bring it to you. He will likely come towards you with the toy in his mouth upon instinct. If not, call him to you with encouraging words and then praise him as soon as he comes towards you with the toy, and reward him with a treat. Continue to praise him each time he brings you the toy, but do not give him a treat. Your new goal is to now get him to trade his toy for a treat. Offer your hand for the toy. If he puts the toy in your hand, immediately praise him and give him the treat as a reward. When you have achieved your goal, take a nice long break. Step 3 – The final step to the fetch Weimaraner training lesson is to have your dog actually find his toy. This means you randomly hide toys or other objects around your home or outside for your dog to find and bring to you. This is a fun game both you and your dog will enjoy once he understands how it works. To start, only use one toy and show it to your dog, allowing him to sniff it. Then tell your dog to “Stay”, and hide the toy (at first, don’t hide it in a difficult or far away location, simply put it in another room until your dog gets the idea). When you return, give your dog the command to “Find” the toy. When he comes back successful, immediately praise and offer him a reward the first few times so he gets the idea. Weimaraner training should be fun and enjoyable. When you are consistent and patient with your teaching, you will get results from your dog. Staying focused and positive makes all the difference in the world.